At TranscenDental Group, we believe in having strong ties with our community, and nowhere are those ties stronger than in our service to Dartmouth families. With our devotion to compassionate dental care, continuing dental education and preventative medicine, we are here to ensure that your family enjoys good dental health for a lifetime. 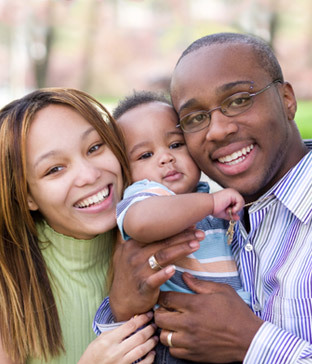 We serve all family members from babies to seniors. A child’s dental health care begins at birth. Your baby’s teeth are already beginning to grow when they are born, as are the bones of their skull and jaw. During this developmental time we can examine your baby’s mouth, gums and jaws to ensure that they are growing correctly and that their baby teeth are growing in appropriately. In early childhood we will be there to provide care during teething and also to help you learn to provide your child with proper brushing and dental health care. Regular visits to the dentists’ office also help young children become used to dental examinations, which makes later visits much less stressful for them. In time, as their adult teeth begin to emerge, we will help children learn how to brush and care for their teeth, and we will also monitor the growth of their adult teeth to ensure there are no alignment issues or issues with their wisdom teeth. Late childhood and the early teens are the optimal time to address alignment issues because your child’s teeth are still growing and can be realigned more easily than when they are fully grown in. Brushing your teeth at least two times every day or after each meal. We recommend that you use a toothpaste that contains fluoride to help to prevent tooth decay. Flossing at least once every day or after each meal. This helps to remove food debris and plaque that cannot be reached by the toothbrush bristles. Maintaining a nutritious, well-balanced diet. Avoiding excessive amounts of sugary, acidic, and sticky foods can help to keep your smile healthy and free from decay. While we provide a number of restorative options to repair your smile after decay, damage, or trauma, we would much rather help you prevent dental problems than fix them! We strive to provide high-quality preventive dentistry so your smile stays healthy and free from dental problems like decay and periodontal disease. To keep your smile healthy and strong, we may recommend preventive dental services. Routine cleanings are essential to keeping your smile free from tooth decay and periodontal disease. These regular visits also allow us to check for and treat any other dental problems before they become more serious and painful. A dental sealant is a thin coating of resin material that is applied to the chewing surface of a tooth (usually the molars and premolars). This coating protects your teeth from the bacteria, plaque, acids, and sugars that cause decay. Fluoride is a naturally found mineral that helps to protect your teeth from decay. Our dentists will make certain you receive the appropriate amount of fluoride to keep your teeth strong. We also encourage you to maintain good dental hygiene at home, which includes brushing and flossing your teeth every day. We offer specialised dental care for seniors and for caregivers including consultation on issues such as how to take care of your dental health when your mobility is reduced, instructions for caregivers on how to clean and care for seniors’ teeth, and fittings and repairs for dentures. If you would like to consider us for family dentistry, we encourage you to speak with a member of our friendly and knowledgeable dental team. We are always happy to help Dartmouth families however we can.